How this ancient text is being studied and interpreted - by women, commuters and academics - in the modern world. In the second of two programmes, Rabbi Naftali Brawer delves into one of the greatest books ever written, which holds the key to unlocking Jewish thinking and history. Far from being an ancient text written in Hebrew and Aramaic, Naftali discovers that today, in orthodox circles, the Talmud is causing a Jewish revolution. He encounters commuters on a train in New York who hold Talmud classes in the last carriage every morning on their way to work. They claim the wisdom of the Talmud informs the decisions they make in business, finance, law and everyday social matters. He discovers that some Chinese and South Koreans have an obsession with the Talmud, thinking it will give them business and financial success. There is even a Talmud hotel in Taiwan. Talking to one of the Jewish world's leading medical ethicists, Naftali hears how the Talmud informs medical decisions from start and end of life matters to genetic research. Whilst in Jerusalem, Rabbi Naftali finds a twist in the tale of the Talmud. Previously being denied access to the Talmud, a growing number of women are now learning and teaching its ancient texts and wisdom. This in turn is bringing a challenge to orthodox male interpretation and hegemony. 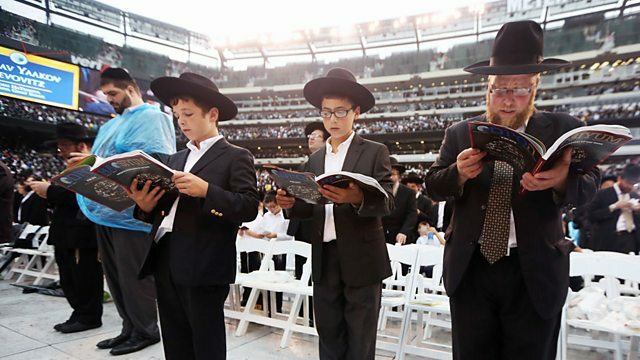 Despite being the Jewish homeland, Israel is facing deep political schisms, financial crises and riots over the determination of the ultra-orthodox community to study the Talmud, and its related literature, rather than enter the employment market and take part in National Service. Talking to Knesset Member Ruth Calderon and ultra-orthodox students from one of Jerusalem's leading yeshivas, Rabbi Naftali encounters the intractable nature of this argument which is threatening the current Israeli coalition government.